Moon Palace Dunes Hole 2: This par five has a tough drive between the water to the right and the course boundary to the left. After that, the second shot should favor the left side, as the green is angled left-front to back-right and is very skinny with steep drop offs to the left (grass) and right (bunkers). Moon Palace Dunes Hole 4: This par four has water I play on the drive and the second shot must cross the lake again, but it is not too close to the green. The best drive will challenge the bunkers fro the tee and, like so many other green complexes on this course, it features several swales and sand traps waiting to catch errant efforts. 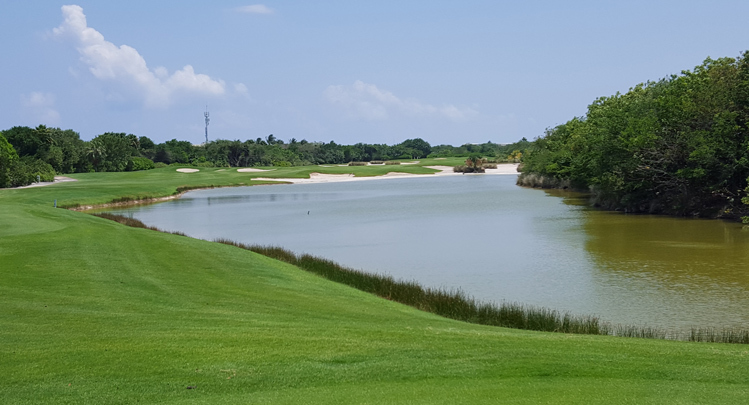 Moon Palace Dunes Hole 5: This fairly long par four has water left off the tee and a large bunker right to contend with (and jungle right of that). The green is long and slightly uphill with water again on the left. 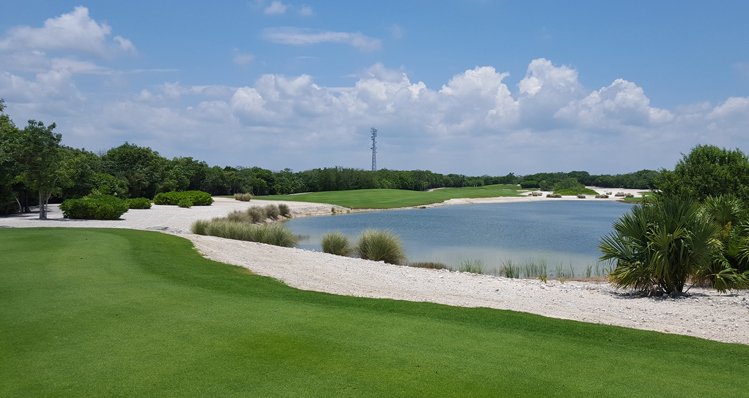 Moon Palace Dunes Hole 7: A bit of a breather, this short par four has bunkers and white sand "dunes" around, but there are many available club selections to avoid them. The green is near the water but pins cut to the right are far more dangerous. A left pin will leave a real birdie opportunity for most players. 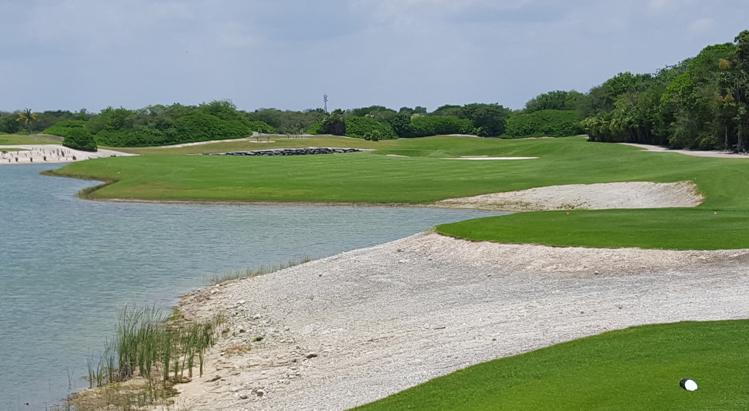 Moon Palace Dunes Hole 9: This relatively long par four is pretty tight off the tee and has an uphill second shot to a green that actually runs away for the first third. Two solid shots will be needed for par here. Moon Palace Jungle Hole 2 (left): There is a ton of bailout room to the right on this par three, which is good because left will get wet (unless the player finds the tiny bunker long/left. The green also has more than the usual undulation that this course provides, so putting can be a test. 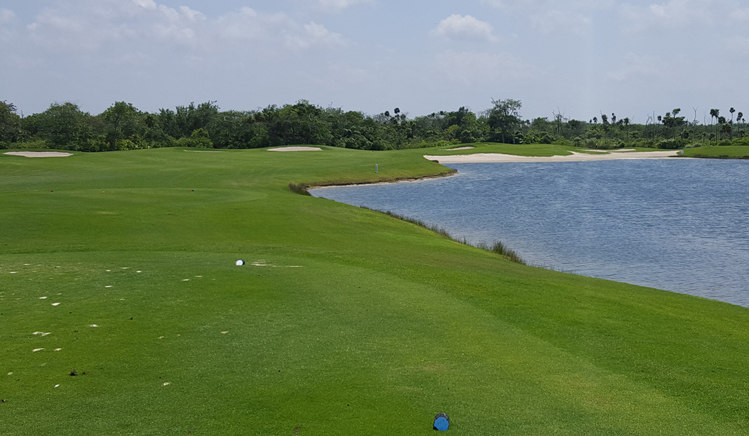 Moon Palace Jungle Hole 4 (below): The drive on this par five is picturesque with a good combo of lake, jungle and sand facing the player. From there, the hole is actually fairly easy with only the large bunker short of the green providing any real obstacle to avoid. 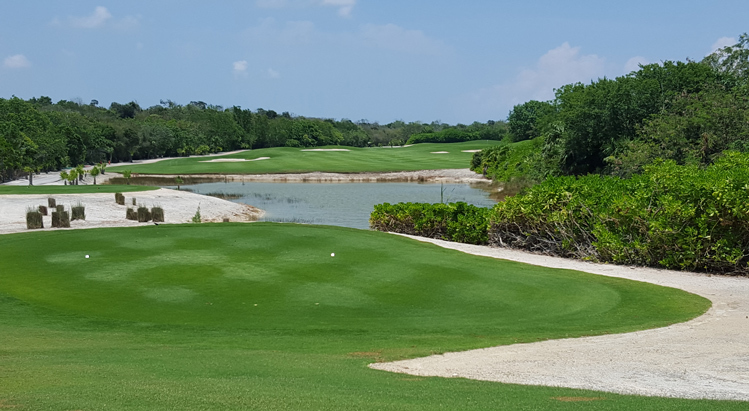 Moon Palace Jungle Hole 5: This long par four probably has the toughest drive on this combination of holes, with jungle on both sides and less room for error than on other holes at Moon Palace. Moon Palace Jungle Hole 6: The short par four on this side has water down the right and the green is pretty small, with going long more than 3 yards equaling a "jungle ball". Thus, although a big hitter can reach the green, the penalty for failure can be quite high. 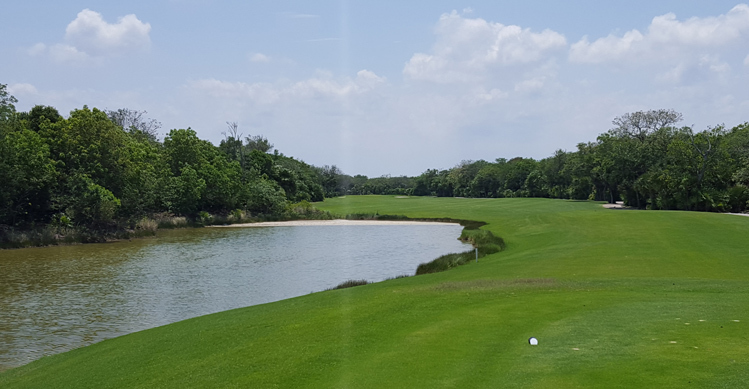 Moon Palace Jungle Hole 8: Not long or particularly difficult, this par four places a premium on a well-placed tee shot to allow a good angle into the pin on the fairly accessible green complex.